When I finished my ninth floral block, I began thinking about ways to set the blocks. 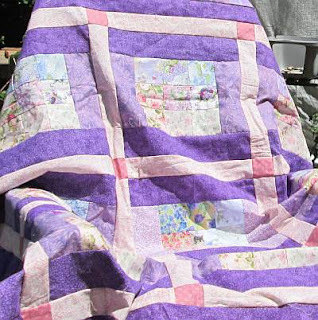 My first thought was to set them the same way as the Crooked Man's Christmas Quilt, but the purples were overpowering and needed to be subdued somehow. Green sashing was my first thought, I tried dark green, light green, medium green. None of them seemed right. The purples still hogged the show. The blocks sat for a week until one day I noticed the light pink fabric I had used in the ninth block sitting in my basket of fabrics to put back on the shelf. I auditioned that and was quite pleased, but it needed cornerstones. A little more digging produced a scrap of dusty rose fabric that helped bring out the pinks in the floral fabrics used in the original blocks. 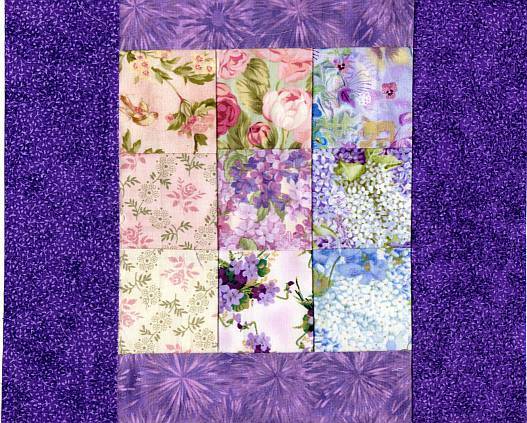 Adding both pinks helped draw the eye back to the 9-patch blocks instead of staying on the purples. 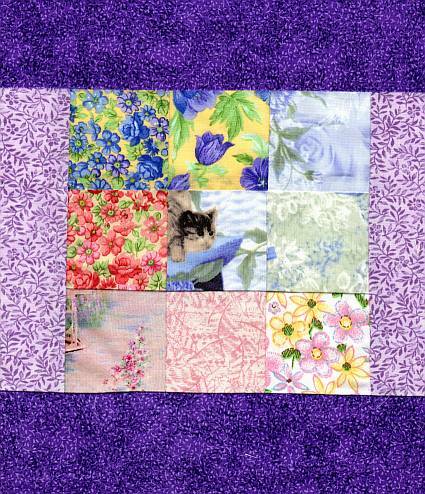 Soon as I began piecing the borders together, my quilt's name changed from Leftover 9-Patches to Pixie Garden. 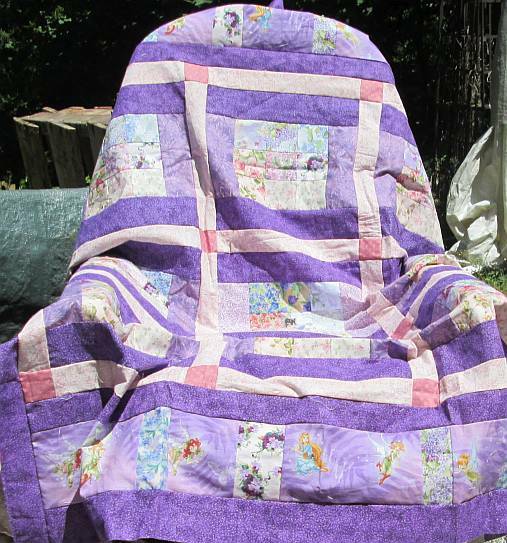 It's a quilt most any little girl would love, but I have to admit that I rather like it, too. Someday, I'll take a better photo, but this gives an idea of what the top looks like. The dark purple is the only fabric that wasn't a leftover or a scrap. I've been dealing with some strange muscular issues that, while not completely derailing me, have slowed me down to sloth speed (that's about 6 feet per hour according to a tv show I watched). One day in April, I woke up unable to move my arms without weird cramping pains that were most pronounced when my elbows were bent. Doing something with a side-to-side motion, like moving a carton of eggs from the counter to the refrigerator, was practically impossible (without dropping the eggs!). No one really knows what's causing the pain, but through trial-and-error I've learned that keeping my elbows bent and using the computer mouse make it worse. So I'm keeping mouse use to a minimum and finding activities that make me straighten my arms every few minutes. I've been hand-quilting the Crooked Man's Christmas quilt with 6 strands of embroidery floss, cutting the thread as long as I dare so that my arm has to straighten as far as possible each time I take a stitch. And I'm doing the same with a couple of unfinished plastic canvas and cross stitch projects. I don't recommend cutting yarn and thread that long as a rule, but in my case a bit of tangling and a few unwanted knots are worth the risk right now. 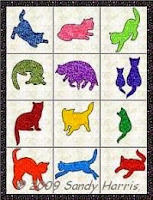 After finishing the Crooked Man's top, I found a short stack of eight 9-patch blocks made 5-plus years ago. In the same basket were some sashing strips leftover from another project from several years ago. 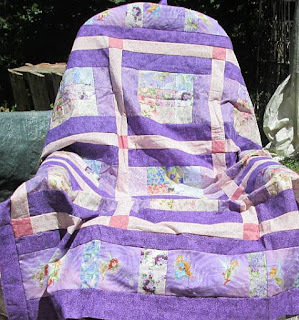 The colors were right, so I sewed the sashing strips to two sides of the 9-patch blocks, thinking I'd find find a coordinating fabric scrap somewhere for the other two sides, then I'd sew the blocks together into a table runner. 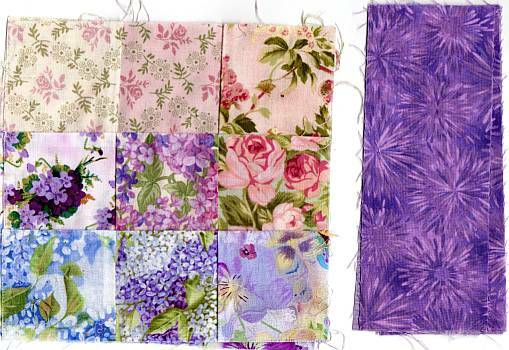 but I couldn't make myself sew them into a table runner. I have no use for a purple table runner, and I couldn't think of a friend or a relative who would want a purple table runner. But what else can you make with eight square blocks? The choices are rather limited.